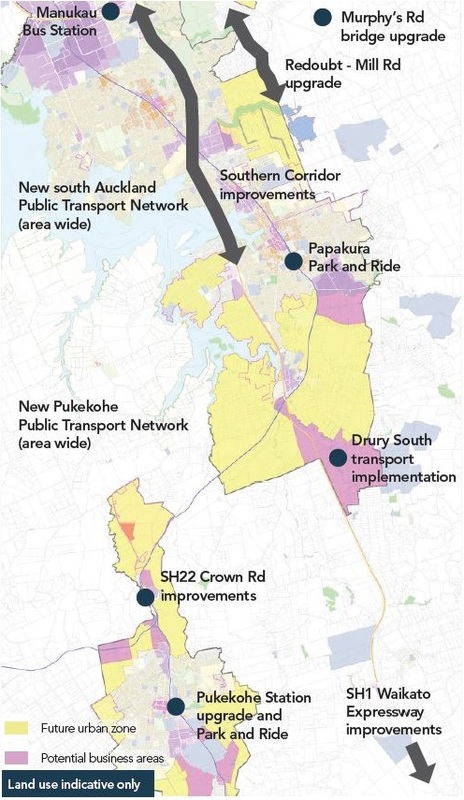 Auckland Transport has begun taking feedback on how transport options could be shaped in the South – the fastest growing area in Auckland outside of the City Centre itself. Now when I refer to the South I mean from Portage Road Otahuhu down to Pukekohe and Waiuku. Auckland Transport in this case has referred to the South as from Manukau and the Airport to Pukekohe so for this exercise we will use the AT definition. We want to hear your views on how transport can be integrated with new communities in southern Auckland. New localised transport improvements will be provided for special housing areas as they are built. Separate shorter distance trips from longer distance trips. Improve the resilience of the network. Improve access to education, employment and recreation opportunities in the area. Predicted that 80% of morning work-trip destinations will be no further north than Manukau and the Airport. Scale of growth will mean there is a need for stronger north-south connections. Lack of east-west connections in the Takanini and Drury areas. This is a menu of transport ideas. A decision will need to be made on the right mix of transport improvements to the south. Rapid transit between the Airport, Manukau and Botany with good connections to rail. Easier public transport journeys from Manukau to the south. Increase public transport or freight provision on SH1. New north-south corridor between Manukau and Drury. Additional stations between Takanini and Pukekohe. Improve local connections between Papakura and Drury. Extend capacity and safety improvements on SH1. Express services on the rail corridor. New or improved routes from Pukekohe to SH1. More walking and cycling paths. More capacity on existing roads. Further development around Takanini is sequenced for about 2027-31. Enable a well connected new centre to develop adjacent to Takanini East industrial area. Strong freight connections from Takanini industrial/ commercial area to State Highway 1 and Waikato. Transport choices with good walking and cycling, frequent and reliable public transport. Increased safety risk and train frequency means we need to remove all level crossings in Takanini. Connectivity to rail and State Highway 1. Providing north-south and east-west connections. Issues with ground stability a challenge to providing integrated transport and storm water solutions. North-south corridor improvements: should the Mill Road corridor, marked on the map with a navy dashed arrow, extend south to better connect the southern growth areas at Drury and Opaheke and beyond? Rangi Rd to Mahia Rd connection. Potential new train station at Tironui, marked on the map with an orange and green area around a train symbol: how important is this station to the growth area or should we improve access to the existing Takanini station? Further development around Drury-Opaheke is sequenced for about 2032-36. 1 town and 2 local centres. 1 town and 1 local centre. Successful town centres and the area connected with public transport. Transport choices with good walking and cycling facilities and frequent and reliable public transport. Provide improved freight connections to State Highway 1. Developing a resilient transport network with alternative routes. Improve access to these areas without making long distance travel between Auckland to Waikato worse. Should the Mill Road corridor extend south to better connect the growth areas at Drury and Opaheke and provide an additional north-south route? 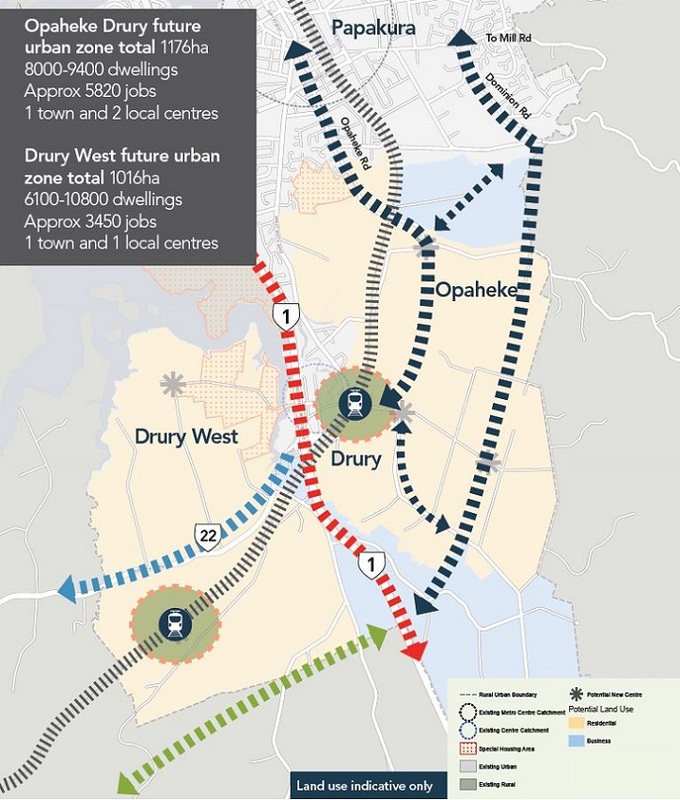 Should another north-south corridor be provided between Drury and Papakura? A potential future rail station, marked on the map with an orange and green area round a train symbol, associated with the Park and Ride at Drury has been identified. Would another location be better? Potential new east-west corridor: Should future improvements to address current capacity and safety issues be focused on SH22, marked on the map with a dashed blue arrow, and targeted at travel times and reliability? Or should the Mill Rd corridor be extended west to Pukekohe, marked on the map with a green dashed arrow, with SH22 improvements focused on safety and improved access? Should current improvements to State Highway 1, marked on the map with a red dashed arrow, be extended to Drury or beyond? What is most important for these improvements, a focus on travel times, reliability, safety, access or something else? 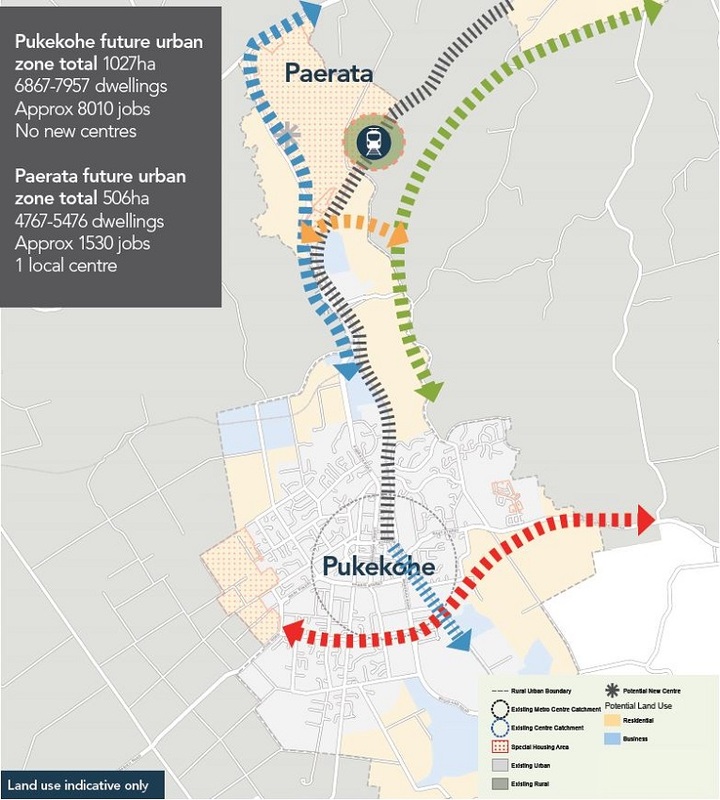 Further development around Paerata and Pukekohe is sequenced for about 2022-31. Pukekohe to expand as a successful satellite centre. Strong and efficient north-south connections. Transport choices with good walking and cycling and frequent and reliable public transport. Provide efficient freight connections to State Highway 1. Providing strong connections to Waikato. Managing increasing pressure on State Highway 22. Improving access to this area without making long distance travel between Auckland and Waikato worse. A potential rail station (including park and ride) at Paerata has been identified, marked on the map by a train symbol with a green and orange area around it. How important is this station to the growth area? Is there a need to provide a Pukekohe bypass and upgrade to Pukekohe East Road to State Highway 1, marked on the map by a red dashed arrow, to improve business and freight movements? Increased safety risk and train frequency means that we may need to reduce the number of rail crossings and provide bridges over rail in Paerata, marked on the map by an orange dashed arrow. Where are the key areas for potential future east-west crossings in Paerata? Should future improvements to address current capacity and safety issues be focused on State Highway 22, marked on the map with a blue dashed arrow, and targeted at travel times and reliability? Or should the Mill Rd corridor, marked on the map with a green dashed arrow be extended west to Pukekohe, with State Highway 22 improvements focused on safety and improved access? Electric trains to Pukekohe: Planning is underway for extending electric trains from Papakura to Pukekohe. Beyond this south of Pukekohe could be serviced by bus or rail. Would there be sufficient demand to extend rail services to the northern Waikato growth areas (Tuakau, Pokeno and beyond)? Tell us whether we’ve got the aspirations and issues for southern Auckland about right. We want to know which ideas appeal to you or whether there are other initiatives we should consider. Give your feedback online by 3 March 2016. The feedback form should take about 10-15 minutes to complete depending on your answers. If you are visually impaired or have difficulty completing forms due to a disability, you can call us on 09 366 6400, and our call centre staff can complete the form on your behalf. Sunday 21 February, 8am to 5pm, Pukekohe Showgrounds, Station Road, Pukekohe. Thursday 25 February, 4.30pm to 8.30pm, Takanini Hall, 8 Takanini Road, Takanini. Saturday 27 February, 10am to 2pm, Drury Hall, 10 Tui Street, Drury. I applaud Auckland Transport for this comprehensive high level look at both the situation facing the South and options available to help keep people and freight moving through the sub-region. Thank you Auckland Transport. As noted those figures do not include Brownfield growth (existing urban areas) and the South houses four of the five heavy industrial complexes as well as Manukau City Centre the largest of the Metropolitan Centres in Auckland. By the end of the Auckland Plan in 2042 Southern Auckland is due to hold up to 45% of Auckland’s population so we need to make sure they can move around efficiently. 80%? Is there something Auckland Transport knows that the South does not know? When I ran my commuter series and produced my evidence to the Unitary Plan for the Centres Zone topic (the Manukau Super Metropolitan Centre) it was predicted that 50% approximate from the South would commute within the South now and into the future and we should plan accordingly. Auckland Council refuted that claim in their rebuttal evidence against me in Topic 051 of the Unitary Plan Hearings so where Auckland Transport has gotten 80% of commuting trip from I would like to know as it has repercussions to the Unitary Plan itself. Looking at the general transport options Auckland Transport has mooted (“Potential Projects”) Auckland Transport has covered quite a few areas although some need to be looked at very carefully. The buses running from Papakura East up Mill and Redoubt Roads to Manukau City Centre and the incoming Transport Interchange. As for building new roads to replace roads like State Highway 22 and Opaheke Road I am more inclined to upgrade the existing roads for before building new ones which effectively trigger induced demand and even more congestion than an upgrade would. I do believe State Highway 22 should be extended all the way through up the Mill Road corridor although that means the route comes under NZTA jurisdiction rather than AT’s. I also do believe NZTA should just whole-hog it and 3-lane the Southern Motorway in both directions all the way to Drury given that is where the southern urban limits stop. In terms of public transport Auckland Transport has put the Tironui, Drury South and Paerata Stations on the cards to widen the catchment of the rail network. However, nothing is mentioned of electrifying the Line to Pukekohe nor building a third main from Pukekohe to Westfield to allow the increase volume of passenger and freight trains on the Southern Line. I see Auckland Transport is finally a looking at grade separations of the rail crossing in Takanini which are prone to holding up traffic with the increased amount of trains running along the line. 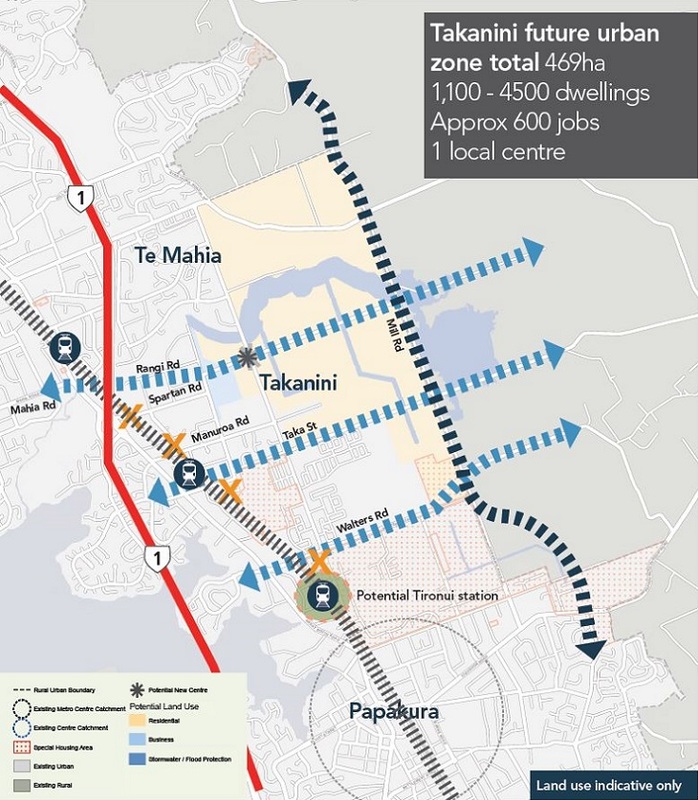 AT are also finally looking at east-west connections across the South as well given that is the main direction of freight as it goes between businesses and the Southern Motorway. One thing though is I wonder if an Inland-Port in Drury South (where the fifth industrial complex will go) should be built allowing transfer of freight between trucks and train without needing to hit the Southern Motorway to go to Wiri or Southdown (or even going south). Something to look at. Auckland Transport has mentioned better public transport connections between Manukau and the South pointing at the Southern Line itself. After the setback I had with the Manukau South Link late last year I wonder if AT are reconsidering it as part of a longer plan. If they are then there might be good news for the South indeed. Overall Auckland Transport has covered a lot of ground looking at transport into the future with the growing South. The catch next is to prioritise the right projects that give maximum bang for buck (i.e no new de-facto motorways). Get your submission in by next month for your say on how the South’s transport system should look into the future. Excellent blog Ben. Hopefully see you at the Takanini meeting. Labour and Government United on the #UnitaryPlan ?